When a recording of forgotten music on a forgotten instrument appears on the prestigious ECM label, chances are good that something ear-opening has been exhumed from the graveyard of history. On his latest release for ECM’s New Series, the Russian pianist Alexei Lubimov performs music of Carl Philipp Emanuel Bach (1714-88) on the all-but-extinct Tangetenflügel (tangent piano), offering the listener a double oddity: a rarely heard composer interpreted on a rarely heard instrument. The tangent piano represents a broken branch in the genealogy of the piano. It was produced in the second half of the 18th century alongside the fortepiano, the immediate ancestor of today’s pianoforte. As early as 1751, Franz Jacob Späth, a builder of clavichords, fortepianos and organs, was producing tangent pianos in Regensburg, Germany, assisted later by his son-in-law and partner, Christoph Friedrich Schmahl. Fewer than 20 examples, fragile and temperamental, survive. The tangent piano’s simple playing action, in which only a couple of moving parts transmit the player’s finger energy to strike the strings, affords the performer intimate control of the sound. Small “tangents” of bare wood, rather than the felt-covered hammers of the modern piano, hit the strings with a truly percussive effect. Sight unseen, the tangent piano sounds like the Middle Eastern santur, the Eastern European cimbalom or the hammered dulcimer. Visually, it could be confused with a harpsichord or Viennese fortepiano. Tonally, however, the plucking action of the harpsichord produces a “plick,” and the light-hammered fortepiano a “pahng,” but the tangent piano a “pingk.” Of course, unlike those other two early keyboard instruments, the tangent piano is as endangered as the black rhinoceros. The instrument has two knee-activated levers under the keyboard, the equivalent of the foot-operated damper and “una corda” pedals on pianos today. 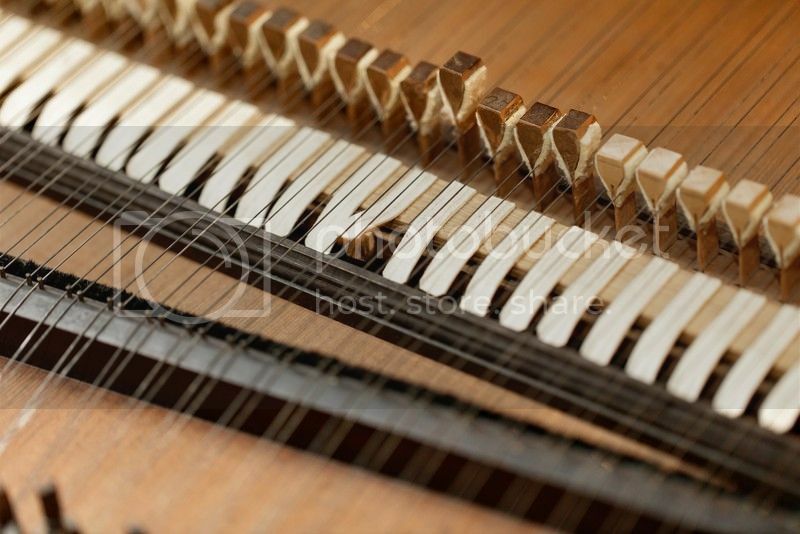 Raising the dampers allows the strings to resonate, while the “una corda” lever physically shifts the keyboard so that, of the double strings provided for each note, only single strings are struck. Further mechanical options allow the performer to experiment with color and interpretation — rather like Instagram filters. The “moderator,” which slides a thin barrier of leather or cloth between the tangents and strings, removes a bit of brilliance from the otherwise colorful shimmer. On the album, Mr. Lubimov uses a 2006 instrument from the Belgian workshop of Chris Maene, modeled on a 1791 original by Späth and Schmahl that’s now in the collection of the Gemeentemuseum in The Hague, Netherlands. (Given the fragility of the originals, it was prudent of Mr. Lubimov to work on a newly made “antique.”) I have examined a similar instrument, built around 1784, at the National Music Museum in Vermillion, S.D., to familiarize myself with this keyboard curiosity. Mr. Lubimov revels in the instrument’s sonic inventions. A champion of contemporary music who also has considerable experience interpreting older works on historical instruments, he has chosen, as a perfect pairing to this instrument, the music of Carl Philipp Emanuel Bach. Never fully embraced by modern pianists — unlike his father, Johann Sebastian Bach — C.P.E. Bach prospers brilliantly through this combination of performer and instrument. Rather than the elemental abstraction of his father’s work, Carl Philipp Emanuel demands distinct colors and a headfirst, visceral engagement between performer and instrument. In Mr. Lubimov’s interpretation, strong attacks bloom with bursts of fragrance. Soft attacks, depending on the mechanism used, ring from a distant horizon or whisper through a veil. Most revealing throughout this recording is what a liability for this music is the colossal resonance of the modern piano, when even a clipped staccato note can’t fully decay before the next one sounds. On the tangent piano, one hears not only the beginning of every note, but the end. The instrument allows Mr. Lubimov to play with this space between notes, which he does with endless creativity. Mr. Lubimov offers a riveting introduction to the musical arch that C.P.E. Bach, with his trademark Empfindsamkeit (sentimental) style, built across the first decades of the Classical era, joining the Baroque on one side to the early Romantic on the other. From his choice of miniature solfeggi (not unlike J.S. Bach’s small inventions) to multimovement sonatas and ever-changing, improvisatory fantasias, Mr. Lubimov and the tangent piano may well be the ambassadors this repertoire has long lacked. Cleveland Johnson is the executive director of the Morris Museum and the former director of the National Music Museum. He is a professor emeritus of music at DePauw University. Lance will be fantastically interested in this, but I am reminded of the tour I once took of the Adams property in Braintree, MA. Astonishingly, the Boston Post Road runs right by the property exactly as it did in the 18th century, but my main point involves the Adams home, which was home to both John and John Quincy. The young tour guide was superb (whereby I discovered that John Quincy and not Thomas Jefferson was our most learned president, speaking seven languages fluently), but she made one mistake. She pointed to the spinet piano and called it a harpsichord.